As regular readers will remember, last week I was invited to the celebration of the 50th anniversary of Galway Cathedral in Ireland. 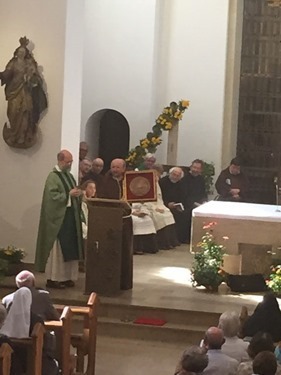 But this past week I also took part in another significant anniversary: the 400th anniversary of the foundation of the Capuchin order in Rhineland Westphalia in Germany. The Capuchins had had a presence in Bavaria, but 400 years ago they came to this more northern region of Germany. 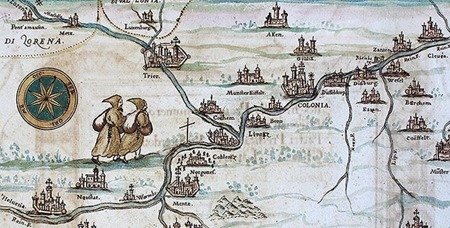 The Capuchin Order was established in that region by an Irish friar, Father Francis Nugent. He joined the Capuchins in Venice and was sent by the pope to establish the order in Belgium, Germany and Ireland. This anniversary has a special significance for me because my own province was founded by friars from this region as well as from Bavaria. In honor of these historic ties, I came to represent the American provinces and Father Gianluigi Pasquale came to represent the Venice province from which Father Nugent originally came. 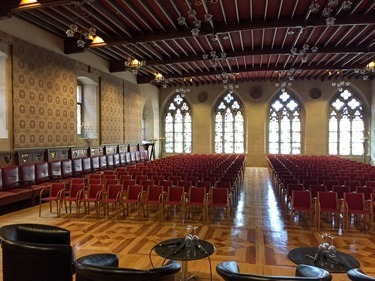 The celebration was held in the city of Münster. 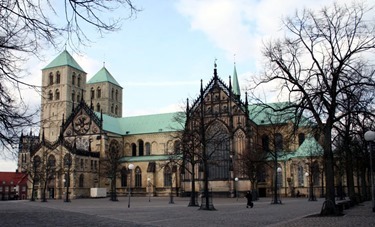 In fact, the city was originally founded as a monastery and it is from “monasterium” that the city’s name was derived. 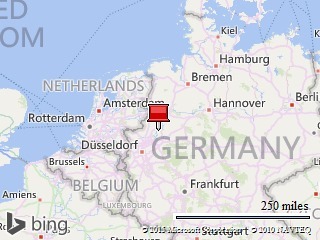 It is a very Catholic section of Germany that for centuries was ruled by a Prince-Bishop. This picture is of the Schloss, which was once the bishop’s residence and is now the local university. 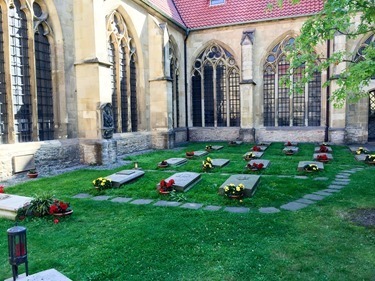 The celebration took place at the Capuchin monastery in Münster. 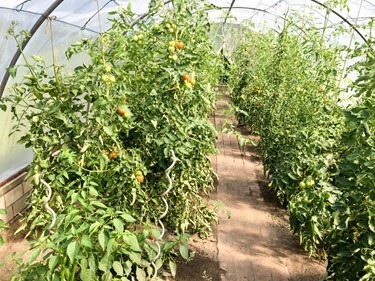 Around the monastery there is quite a bit of land and they raise all their own vegetables and flowers. 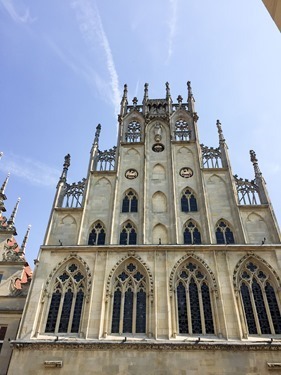 I presided at the Mass and Münster Bishop Felix Genn who delivered the homily. At the end of the Mass I gave about a 20 minute talk about the history of the Order. 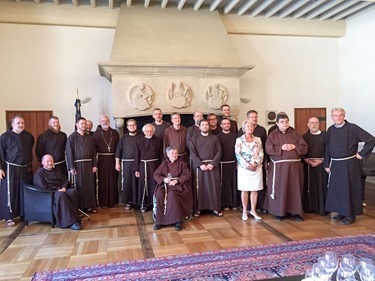 In my remarks I explained how German-speaking friars founded two provinces in the United States on the same day, which were the first Capuchin provinces ever founded outside of Europe. 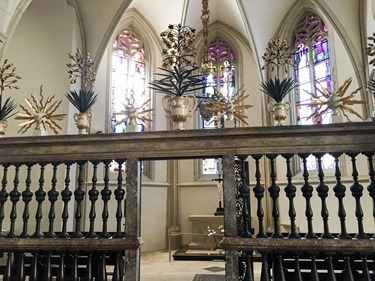 Out of these German-American provinces have come missions to Papua New Guinea, Puerto Rico, Costa Rica, Guatemala, Nicaragua, Honduras, Panama, Japan and Guam, and there are now six Capuchin bishops working in these missions and two Capuchin archbishops in the United States. One might say that having an Irish American Capuchin as part of your centenary celebration is very fitting, since it was an Irish Capuchin, Friar Francis Nugent, who was commissioned by Pope Paul V in 1610 to begin a Capuchin mission in the Rhineland. 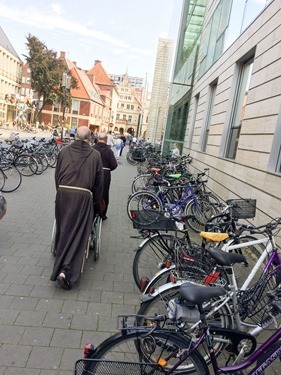 It was Friar Francis Nugent who led the Capuchins, including several other Irishmen, to found the house in Cologne. Many historians consider him the founder of both the Irish and the Rhine Westphalian Capuchin Provinces. Much later, in 1875, it was the Rhine Westphalian Province which sent Friars to Cumberland, Maryland in the United States, a foundation which is still staffed by the Capuchins of my province. In 1881, the 31 Friars of the Cumberland commissariat (who were from the Rhine Westphalian Province) joined with the 36 Friars of the Pittsburgh commissariat, who were Bavarian Capuchins, to become the Province of Pennsylvania the following year. My province, the Pennsylvania Province, was erected on August 7, 1882 on the very same day another German-speaking province in the United States, the Province of Calvary was established. It is noteworthy that these two German-American provinces were the first two Capuchin Provinces established outside of Europe. From 1922 until 1952 there were Friars from the Pennsylvania and Calvary Provinces working as missionaries with the Friars of Rhineland Westphalian Province in Kansu, China. The Calvary Province and the St. Augustine Province eventually split, each into two provinces. The Calvary Province gave birth to the New York (St. Mary’s) Province, and the St. Augustine Province founded the Kansas (St. Conrad’s) Province. When the new province from the St. Augustine Province was formed, I blithely suggested that we name the new province: Adeodatus, after the illegitimate child of St. Augustine. My suggestion was rejected in favor of St. Conrad of Parzam who, we were told, used to serve Mass for our first provincial, and that indeed St. Conrad even volunteered to come to the missions in the United States. These German-American provinces have establish missions in Papua New Guinea, Puerto Rico, Central America (Nicaragua, Costa Rica, Guatemala, El Salvador, Honduras and Panama), Japan, and Guam. There are now six Capuchin Bishops working in those Missions and two Archbishops in the United States. When I joined the Province of St. Augustine in 1965, it was still a very German-American institution. I would have been considered an Irish infiltrator. 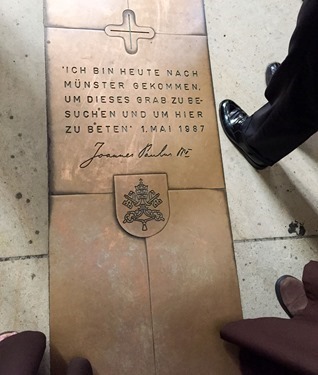 In fact there were people in my Irish parish who asked me why I was becoming a German priest. 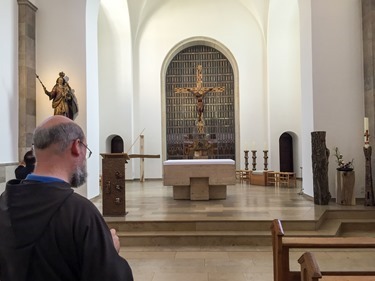 As a matter of fact I do trace the beginnings of my vocation to an encounter that I had with the saintly Bavarian Capuchin priest by the name of Father Bede Herman. As a young boy, Father Bede desired to be a Capuchin; but because of the Kulturkampf, it was decided to send him to America. He arrived on the boat as the 15-year-old boy with a note pinned to his coat saying: I am Innocent, send me to Herman, Pennsylvania. 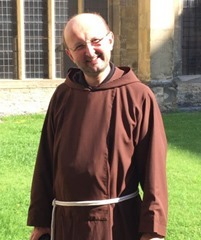 Innozenz Herman eventually became Father Bede who served generations of Capuchins as a spiritual director and confessor. I first met Father Bede when I was a young lad. My older brother, Ted, was going to make a retreat at the Capuchin seminary. I was too young to go on the retreat, but I went along for the ride with my dad. After we dropped off my brother, we met Father Bede who was working in the garden with a hoe. His habit was bleached from the sun, and “patched inside and out.” He was a tiny man with a straggly beard. We chatted with him for a long time, and then my dad and I got in the car and drove home. 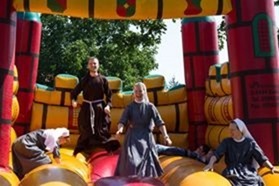 My father said: “that old Friar is the happiest man in the world.” Those words really impressed me. I thought about that old man in the raggedy habit, he did not have a big car or a beautiful wife, and hoeing that rocky garden didn’t look too interesting; but I instinctively knew that my dad was right. 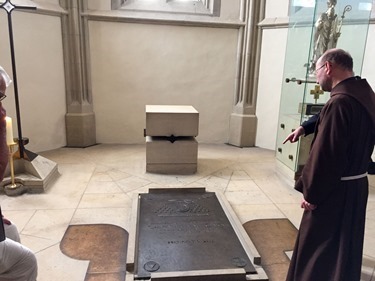 That old Bavarian Friar exuded peace, serenity and goodness. He was truly a happy man. And I thought to myself: I would like to be happy like that too. Several years later I returned to that seminary and for eight years Father Bede was my confessor. 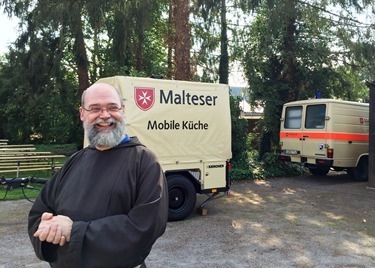 As a seminarian at St. Fidelis of Sigmaringen, I had to prove to some of my newfound German friends that the apostrophe in my name, O’Malley, is not an umlaut. My professors had names like Greenwald, Schreiber, Wandvogel, Schaller, Pastorius, Degenhardt. 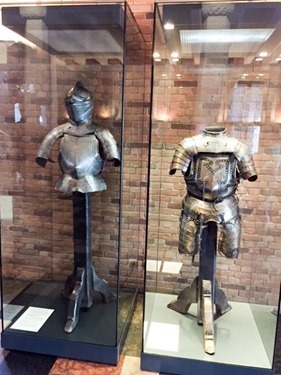 There was still a beautiful German library in our seminary and on top of each of the book stands were scores of beer steins that had once been used by the Friars and seminarians. 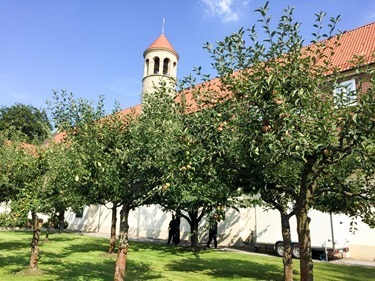 I studied at St. Fidelis of Sigmaringen Seminary, where we got a great formation. The diocesan seminarians that studied there with us Capuchin students, affectionately called it. 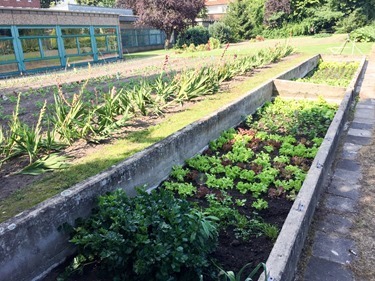 “The Capuchin agricultural school.” When I was a seminarian, two of my favorite activities were taking care of the beehives and working in the butcher shop. Working with bees you learn not to take every sting personally. My other job was working in the seminary butcher shop making German sausages which we consumed several times a week with sauerkraut. 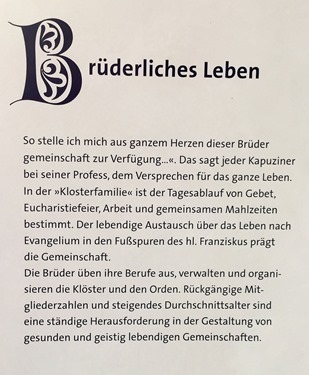 In the butcher shop we worked under the supervision of the German nuns: Die Dienerinnen der Kindheit Jesus vom Dritten Orden des Heiligen Franziskus. It is a very long name for order of very tiny nuns. One of the most memorable days as a butcher was the day I beat a German nun over the head with a broom while shouting at her animal animal animal. The seminarians with me were sure I had gone crazy and that this mild-mannered brother was about to beat the little nun to death with a broom. What had happened was we had just opened a crate of bananas and a huge hairy tarantula jumped out of the box and onto the sister’s veil. I did not know the German word for spider. I just started beating her veil shouting: das Tier, das Tier. It was only after Schwester Notburga saw the dead carcass of the 10 inch tarantula on the floor that her concern about my mental state turned into relief and gratitude. The moral is that something as bad as beating a nun with a broom and shouting animal at her, can turn out to be a noble and blameless activity. It also meant that I should’ve studied German vocabulary with greater diligence. As a Bishop in particularly difficult and challenging times, I have come to understand that God whacks us with the broom and shouts harsh words at us, to knock off the spiders and the cobwebs and to save us from a worse fate. 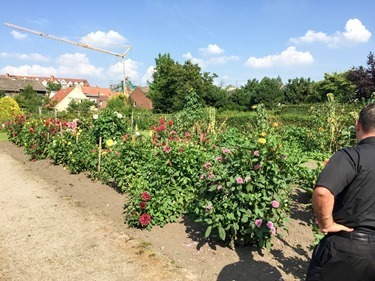 The fact that I have persevered in my vocation is in great part due to the wonderful example and the careful formation that my German Capuchin mentors gave to me and my classmates. The example and fidelity of these holy Friars has had a profound effect on our province; and I believe is one of the reasons that, despite all the challenges we have faced in the American church, that our Province of St. Augustine has been blessed with so many and such beautiful vocations. 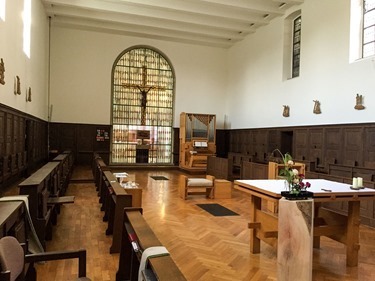 In the seminary we still had many German customs. One year they dressed me up as a Bishop for the Feast of St. Nicholas. We sang German Christmas carols and gave presents to the nuns. 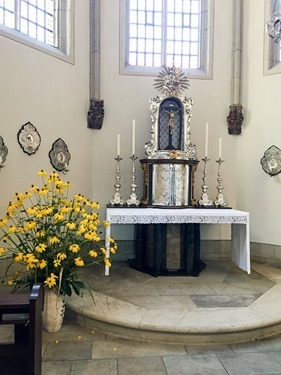 When I went to the novitiate I was invested with the habit of the order, or I should say, the habit of the Bavarian province which we in the Pennylvania Province still wear, even though it has been abandoned here in Germany. 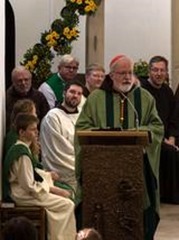 Eventually I was professed and ordained at the Mutterhaus, St. Augustine’s Church in Pittsburgh. St. Augustine’s Church was built for the Friars and the German immigrants by the local brewery over 100 years ago. I suppose that is an indication that the Friars and the parishioners were good customers of the brewery. 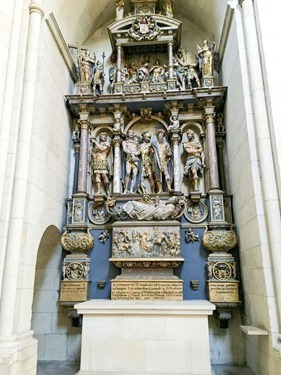 The parish is actually the replica of a very beautiful and historic church in Munich, the Church of St. Benno, with an octagon tower and splendid bells brought from Germany, named for Saints and anointed with chrism. I am so privileged to be here to represent the hundreds of Friars in our Provinces and Missions that have been born out of the missionary spirit of your Province. In their name and in my own, from the depths of my heart I say: congratulations and Vergeltsgott. Following the Mass there was a day-long celebration on the monastery grounds for all the local people. There were many hundreds of people who came for the celebration. It was a wonderfully German celebration, which of course included beer, sausages, musicians and even a soccer match. They concluded the celebration at 7 p.m. with a Vespers Service that included beautiful singing and participation. 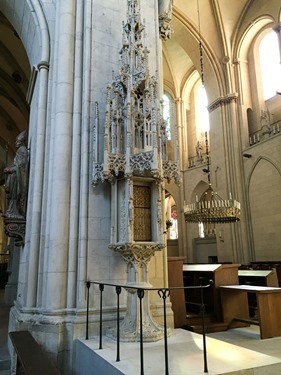 This photo shows the choir stalls where the friars pray. The main church is on the other side, through the grate behind the tabernacle. This is the local superior, Father Marcos. 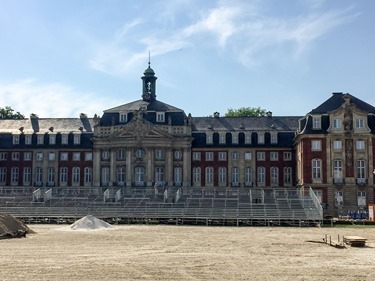 You can see he is standing in front of a trailer with the symbol of the Order of Malta, because members of the Order were among the volunteers who helped set up for the outdoor celebration. 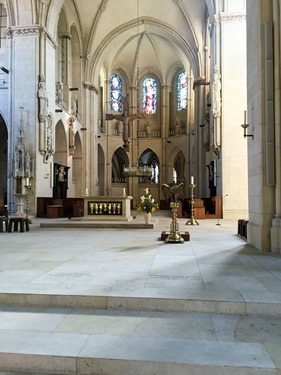 Before the anniversary celebration, the friars gave us a tour of the Cathedral and the city. The Cathedral of St. Paul is 750 years old and is just stunning. 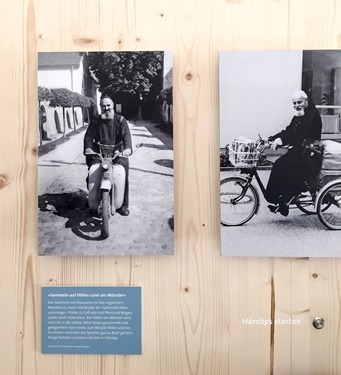 In the Cathedral they had an exhibition on history of the Capuchin order in the area. 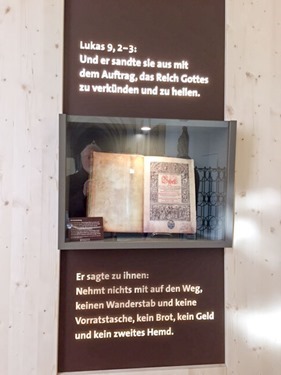 The title of the exhibition was "Betteln und Verkündigen" (“Begging and Preaching”) because, particularly in rural areas of Europe, the Capuchins would go from farm to farm asking for food to support the monastery. These pictures show the porters traveling around asking for donations of food. 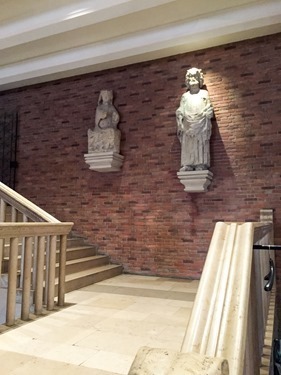 This practice had the effect of forming a great bond between the Friars and the people. 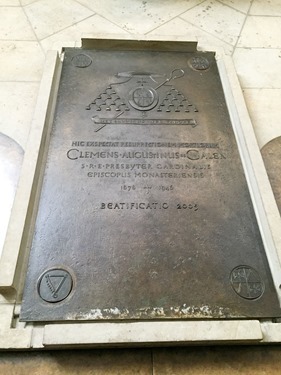 Within the cathedral is the tomb of Blessed Cardinal Clemens August Graf von Galen, who was strong voice of opposition against the Nazis during World War II. Pope John Paul II beatified him in 2005. This is the Blessed Sacrament Chapel in the Cathedral. This is the patio where they buried the canons of the Cathedral. It’s very typical of German cemeteries, which are always very well cared for with flowers and beautiful landscaping. 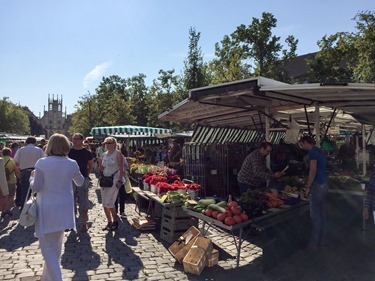 On Saturdays they have a big farmers market all around the Cathedral. 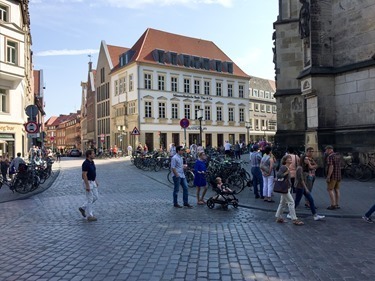 We saw several historical sites including the old Town Hall, where The Peace of Westphalia was signed. 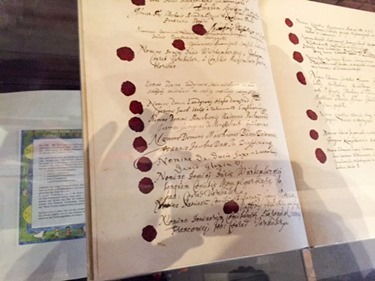 This was the document that ended the 30 Years War and was signed by many different sovereigns of Europe. We also met the mayor, “the Bürgermeisterin,” Karin Reismann. I returned to Boston earlier this week and on Thursday I had the opportunity to visit with Professor Ernest Caffo, President of Foundation Child (Fondazione Child), and academic and research institute based in Modena, Italy. Dr. Caffo was in the Boston area for meeting with colleagues at area universities. The Foundation is dedicated to research on behalf of children who experience psychological difficulties, with the goal of helping the children to achieve healing and establish a sound foundation for their ongoing development. 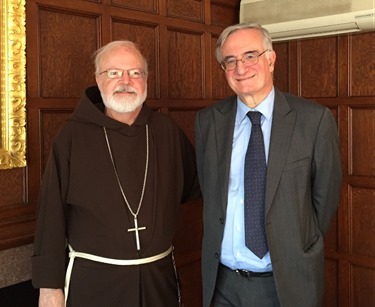 Prof. Caffo shared the Foundation’s willingness to assist with the work of the Pontifical Commission for the Protection of Minors and expressed his high regard for the Church taking a leading role in developing and implementing child protection programs. He noted in particular that the Church is making a significant contribution to the important work of raising awareness in society at large about the need to be vigilant with regard to children always having safe environments. We greatly appreciate his support of the Church’s efforts.